Have you read the book, "The Day the Crayons Quit"? This is SUCH a cute book from the crayons' point of view. They are TIRED of coloring the same old pictures the same old colors. Why does the Yellow crayon have to color the sun? And why can't the Black crayon color a beach ball? We loved reading this book over and over again and coming up with our own take on mixing up the colors in a sensory art project using crayon shavings! 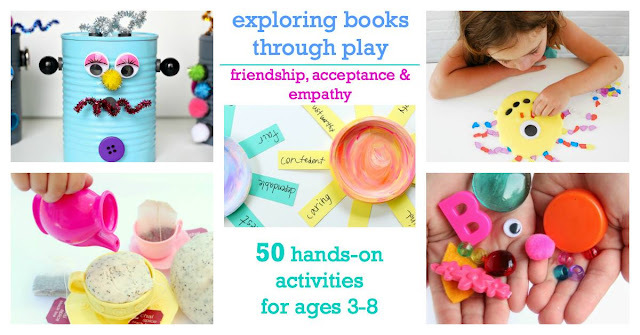 We are super duper excited to be back at the Preschool Book Club series where we'll join a few of our favorite kids activity bloggers and explore a fun children's book every two weeks! We loved reading The Day the Crayons Quit by Drew Daywalt so this sensory crayon shaving art was completely a hit in our house! 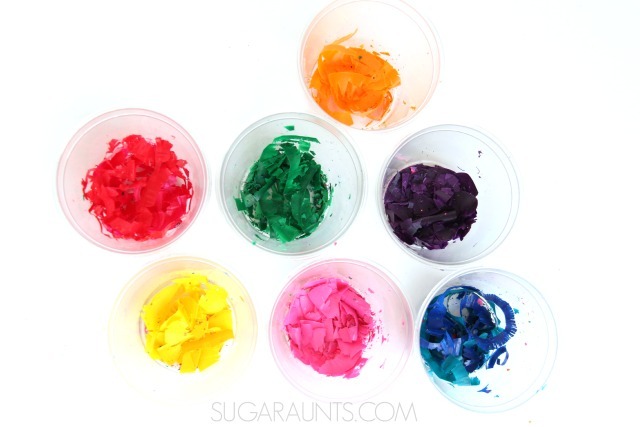 Use the pencil sharpener to make crayon shavings in the colors you want. This is a fantastic fine motor activity for little fingers. Twisting the crayons in the small pencil sharpener really works the intrinsic muscles of the hands. Not only are kids building the hand strength and endurance for writing and coloring tasks, they are using a tripod grasp to manage the pencil sharpener/crayon. 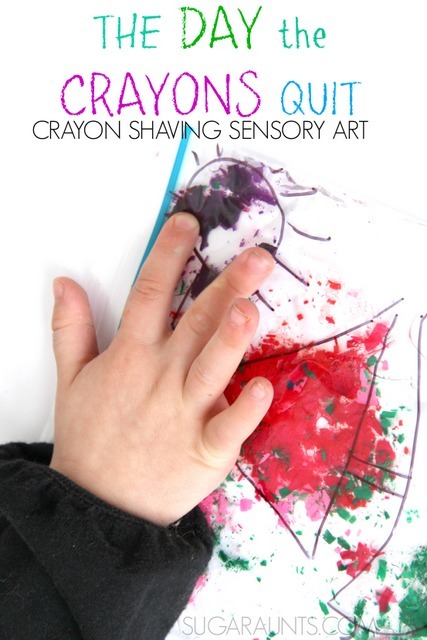 It's a resistive task that might cause hand fatigue for little ones, but not much crayon shavings are needed for this sensory activity. 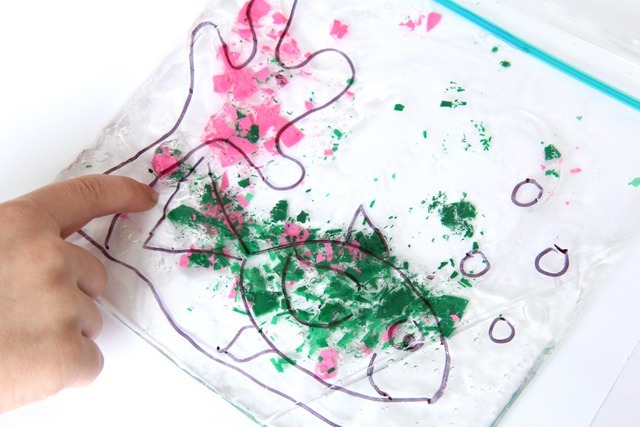 Use the permanent marker to draw a picture on one of the sandwich bags. Fill the baggie with the shampoo and you are ready to get started! Have the kids pinch the crayon shavings into the plastic bag. We tried to get the colors we wanted into the general area of the picture. So, instead of a yellow sun, we made ours purple and tried to get the purple crayon shavings near the sun in the picture. If they don't land exactly near the part of the picture that you want them, it's not a big problem, and actually a good sensory and fine motor activity to move the shavings around in the shampoo. Press and push the colors into the part of the picture to make mixed up colors just like in "The Day the Crayons Quit"
Follow Up Story from Mama. Papa. Bubba.